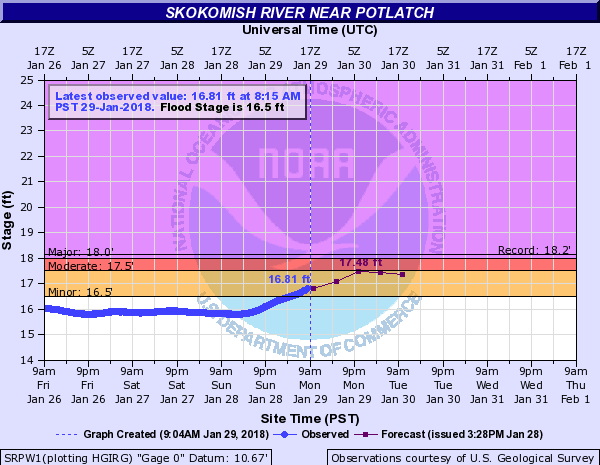 A Flood Warning is in effect for the Skokomish River near Potlatch. Heavy rainfall has driven the River above flood stage. The Skokomish will continue to rise and will approach the moderate flooding stage this evening before receding slowly late tonight into Tuesday. Minor flooding is occurring and minor flooding is forecast. Forecasters predict the river will crest near 17.5 feet around 10 PM Monday. 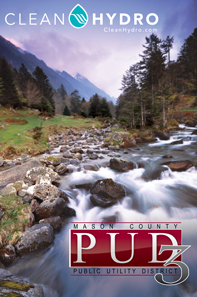 At 16.5 feet, the Skokomish River will cause widespread flooding of pasture lands, with water flowing quickly over West Bourgault Road and Skokomish Valley Road. At last report, flodding has closed Skokomish Valley Road (County Road 41640) to all through traffic at the intersection with Eells Hill Road.